Deals have always been a huge part of our daily life but the Internet surely revolutionized the way sellers conduct and consumers utilize them. So whether you're a customer needing an electronic device, looking for new shoes or food discounts – or a retailer offering the same, deal sites are definitely a huge deal. For sellers it means a bit of a disruption in operations, but at the same time a prospect for increased customer base, getting rid of old stock and SEO benefits. If you manage to engage the community good enough (receiving a terrific feedback) and collaborate with deal sites on a regular basis, you’re in for a journey towards expanding your business. Let’s take a look at 6 deal sites that both retailers and consumers ought to know. While maintaining a clear focus on the“one day, one deal” concept for discounted products, there’s a whole lot more to Woot. Its database is terrific, ranging from electronics to accessories, kids’ stuff or…wine. The community here is pretty strong and retailers can offer their own deals. If wooters like what you offer them, you’re in for some increased sales volume in the future. It doesn't matter whether you'll be selling some of the best cordless hair clippers, running shoes or acoustic guitars. You'll be set. Bonus points for their casual and witty writing style! Focus: Community, fast/daily deals, wide array of niche markets. LivingSocial is one of the best deal sites for local products and services. Its database includes hundreds of cities…and I really mean that. There are also over a hundred different deal categories, wide range of offered online coupons and thousands of brands that roam LivingSocial’s marketplace. If you’re a local entrepreneur, this is the place for you. Their merchant center is terrific for sellers as you can view customer feedback, track payments and have an overall view of how well your offers are doing on the platform. Focus: Local deals, mixed coupons and deals, marketplace with insights on executed campaigns. As coupons were mentioned, I can’t skip RetailMeNot: the largest digital coupon marketplace there is. Share your digital promo code for your products or services with a huge community of customers, or, if you’re a customer, seep through the lists and see what best offer there is. You can also customize your Home Page when you create an account, which helps sorting through the hundreds of thousands of offers. Focus: Digital coupons and promo codes, global lean. Cash back. That’s what I have missed so far. Well, there is always FatWallet – the deal site which combines coupons, deals and cash back. The Wallet tends to lean more towards electronics and computer related stuff, but there are thousands of other niche deals. As with woot!, there is a strong community going on here. FatWallet forums are pretty large and active and a retailer would do good to appeal to those deal-messengers there. Focus: Cash back, mix of coupons and deals, electronics, community-driven. 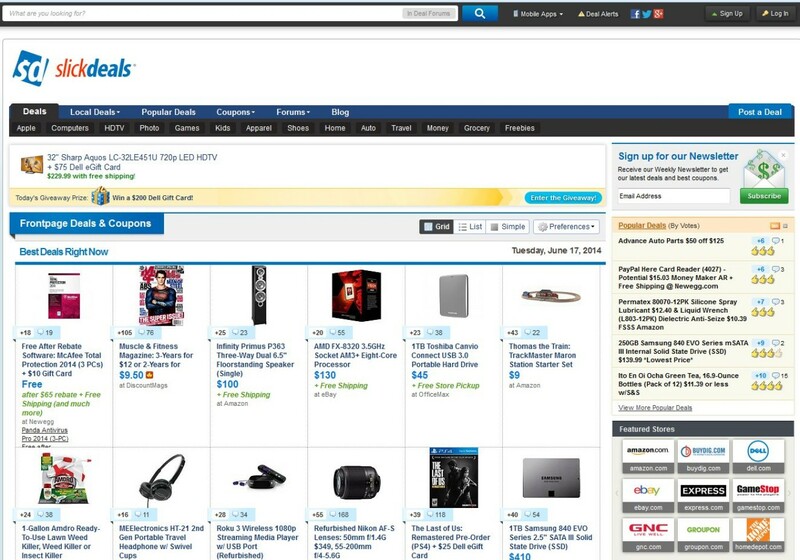 Another community-powered deal site, SlickDeals is perhaps one of the most populated and famous ones. Local or global deals, electronics, apparel, packages for your leisure time, SlickDeals has got all of these covered. You can also see what your favorite online retailer’s up to. What impressed me is the rich options for browsing the huge pool of deals. Adjust your preferences in neat ways in order to maximize your deal search. Focus: Community, browsing customization for users, deals of any scale and niche. Daily deals by city. An enormous database for local offers. Rich sections from hotel rooms to food to education and classes. Groupon is a behemoth amongst giants when it comes to deal websites. As with LivingSocial, there is a merchant center with a cool set of tools. Run your campaign, track what exactly happened during the promotion you set up and maximize your profits as a retailer. Focus: Massive geographical scale and market spectrum, insights on retailer executed campaigns.